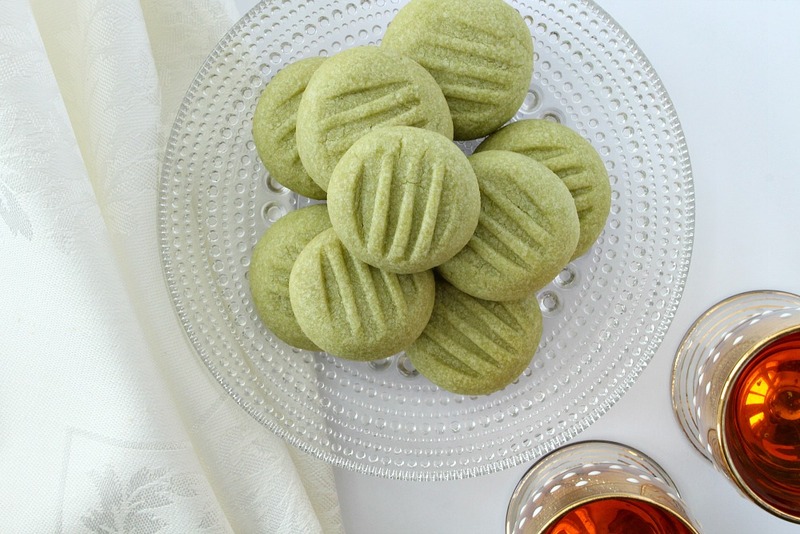 This recipe for naturally green matcha tea shortbread cookies is seriously addictive: you’ve been warned! When I was in University there was intense pressure to wear green on St. Patrick’s Day – I remember getting razzed many times for showing up to class sans green. Frankly, showing up on time and dressed, period, was difficult for me because I spread myself a little too thin going to school full-time, working multiple jobs, and volunteering a lot of my time to not-for-profits. I drove Charlie at the time, so I convinced my peers that cruising around in my lime green hatchback was sufficient cheer. 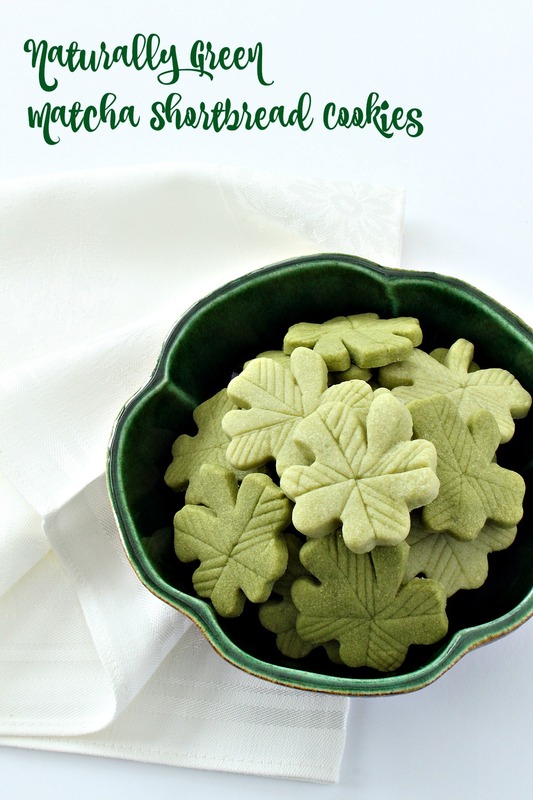 This year I will surely forget to don that all important colour again, but at least I’m prepared with a fun green shortbread recipe. The secret ingredient? Matcha tea! 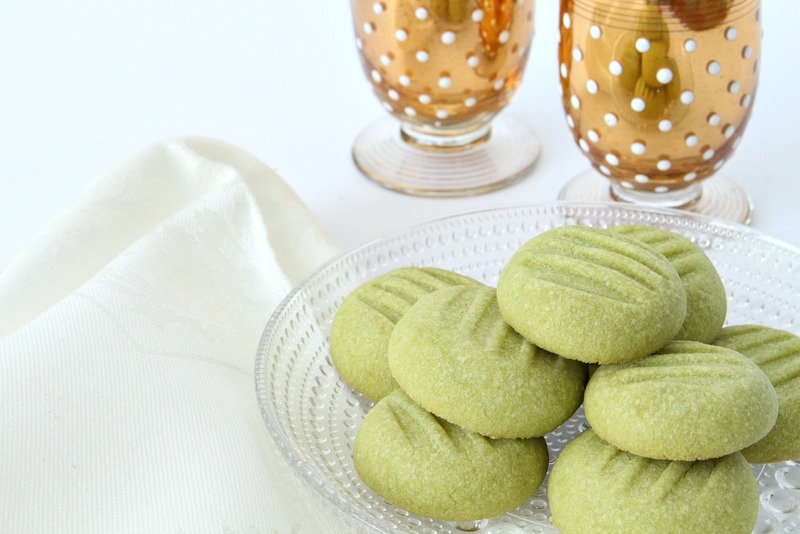 The recipe for these matcha tea shortbread cookies is simple, but these cookies don’t taste like traditional shortbread: they’re smoother (thanks to the icing sugar), deliciously sweet, and naturally green – with a delicate hint of tea flavoring. 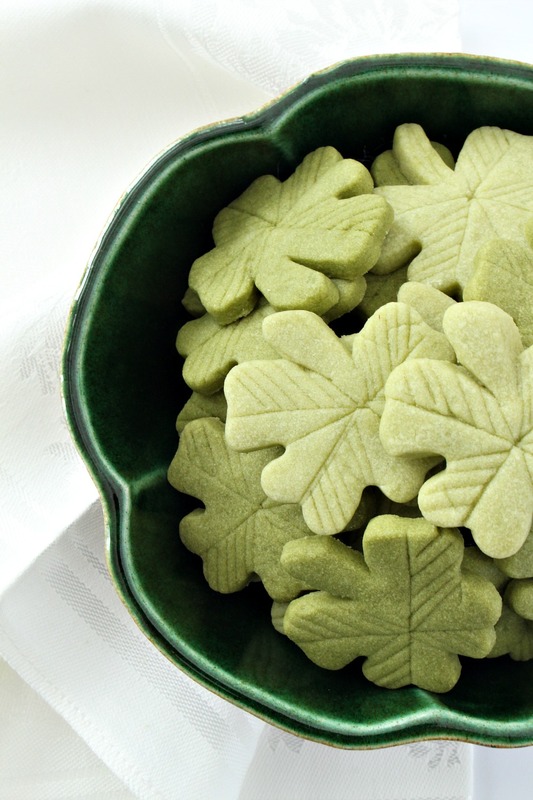 You will LOVE these matcha tea shortbread cookies. My Mom and I have both worked at (different) locally owned tea shops and we’re pretty passionate about tea, although my once extensive knowledge about tea has been filed deep in the dusty corners of my brain. What I do remember is that “tea” is often incorrectly used to refer to steeped beverages that are actually infusions or tisanes – like “peppermint tea”. Technically, only leaves from the Camellia sinensis plant make tea. Matcha is a special kind of tea because the way in which the leaves and grown and processed is unique: the leaves are grown in shade for a period of time before being harvested and once harvested, the stems and veins are removed. It’s then ground into a fine powder and traditionally used in tea ceremonies. Matcha supposedly boasts many health benefits because it is chock full of antioxidants (10x what a normal cup of green tea offers), fiber and vitamins. To drink it, you simply whisk the powder into nearly boiled water and enjoy. 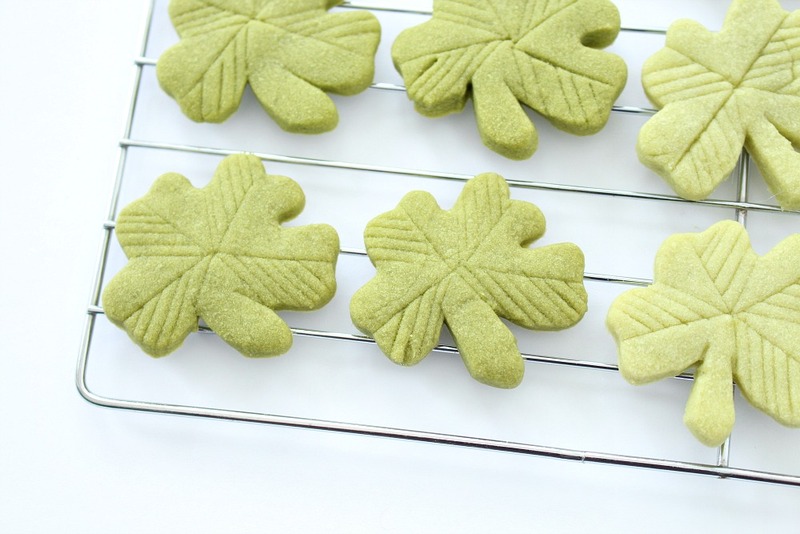 To bake with it, you can easily add it in any recipes that call for dry ingredients – I just substituted some flour from my original shortbread recipe with matcha. 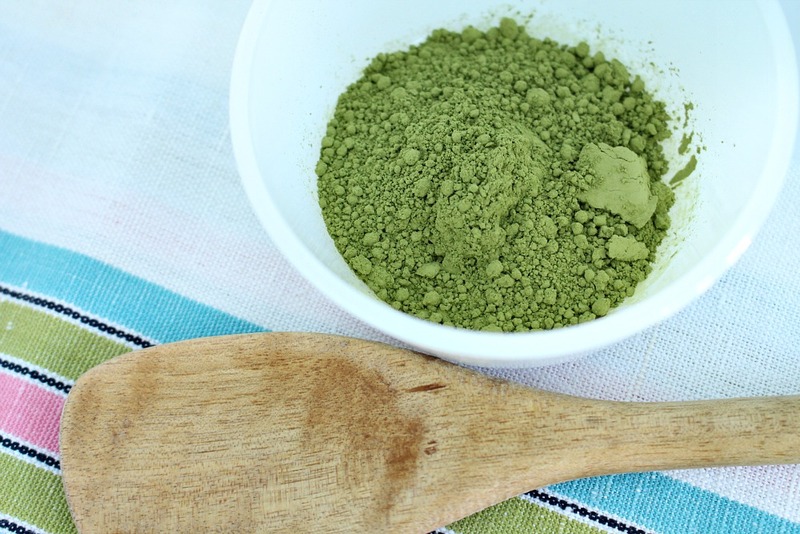 You can find matcha at most tea shops so check local first, but if you can’t track it down you can click this link to snag some on Amazon – there are many different grades and price points, but I picked out something reasonable. 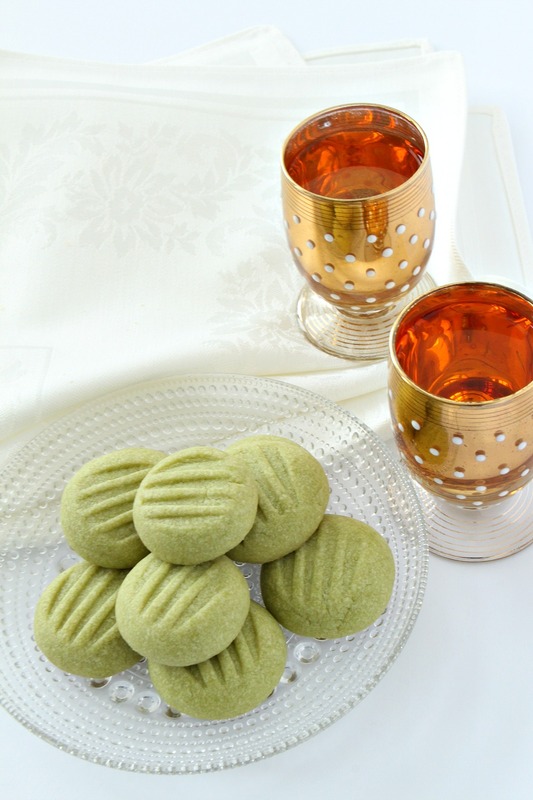 Ceremony grade matcha is more expensive, so keep your eyes peeled for culinary grade which still provides a great flavor and colour, without a steep price. I think everyone knows how to make shortbread! Cream the butter and sugar together until fluffy. My Mom is convinced that doing it by hand – without an electric mixer – is the key to making these cookies perfect. Slowly add the flour and mix well. Then add the matcha, making sure to break up any balls of powder so it blends well. To make the classic “squashed with a fork balls,” form the dough into 1 inch balls with your hands, place on a baking sheet (I lined mine with parchment paper) and, you guessed it, squash with a fork. This style of cookie always reminds me of my Mummu – she does her peanut butter cookies this way. The fork smush style is baked at 300 degrees Fahrenheit for 20-22 minutes. 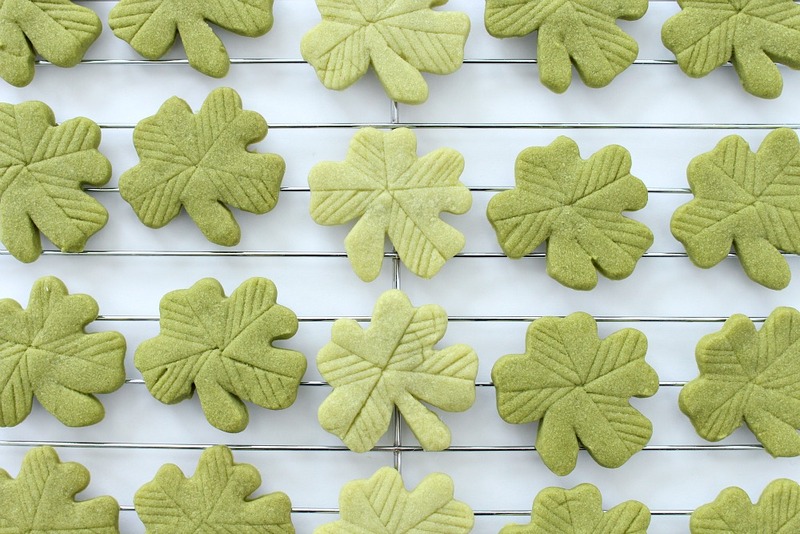 To make a leaf shape for these matcha tea shortbread cookies, the trickiest part is tracking down a four leaf clover cookie cutter. 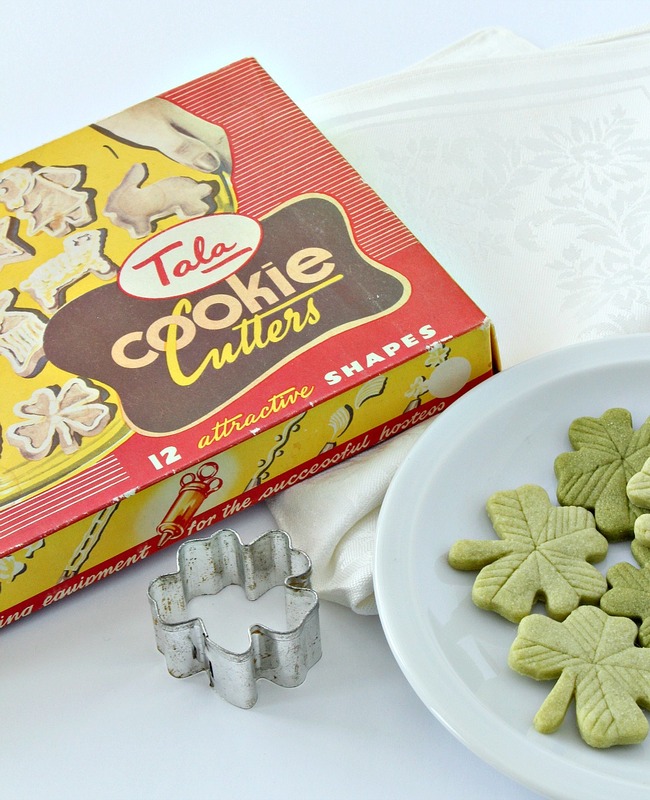 I found one in a vintage set of cookie cutters, but you can easily buy them from Amazon. 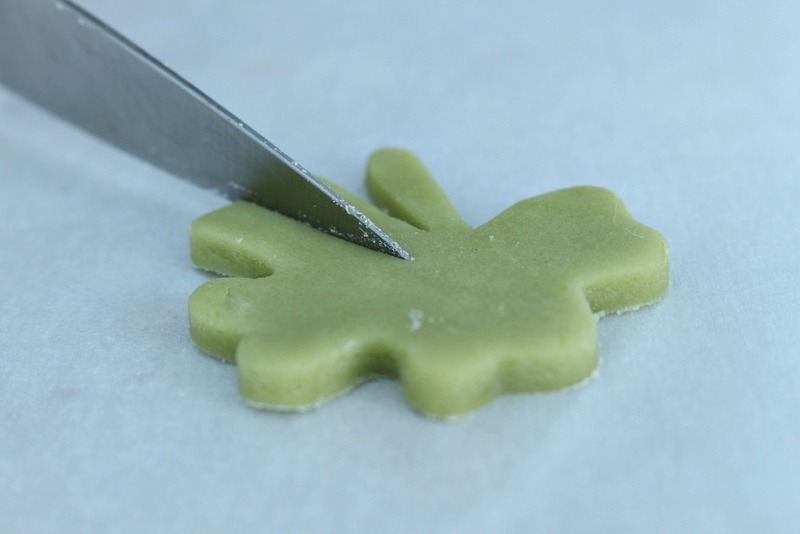 This four leaf clover shaped cookie cutter looks a lot like mine (good price, too). 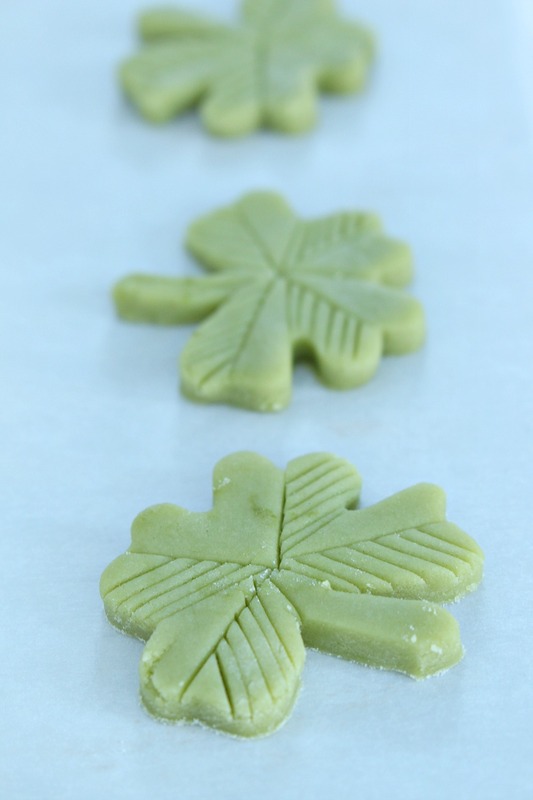 I rolled out the dough on a floured surface and cut out the leaf shapes, placing them on a parchment paper lined baking sheet. Now comes the fun part! These cookies were thinner, so they were baked at 300 degrees Fahrenheit for only 10-12 minutes. I intensified the green by adding more matcha. The first batch had 1 tablespoon but for the second half of the dough, I added about a half tablespoon more. Look how adorable they turned out! I lured my Mom into helping with a few blog projects and we enjoyed a really lovely afternoon baking these – it was kind of meditative to work on the leaf-shaped ones and the process has made me want to try some really beautiful desserts instead of the usual, slap-dash, I need sugar now company’s due in an hour things I used to bake. I’m still cutting back sugar in a big way, but a little treat every now and then is nice. You can barely taste any tea flavor in the lighter batch – they’re just buttery and sweet. The darker batch has a slight tea flavor but it’s still light and sweet. 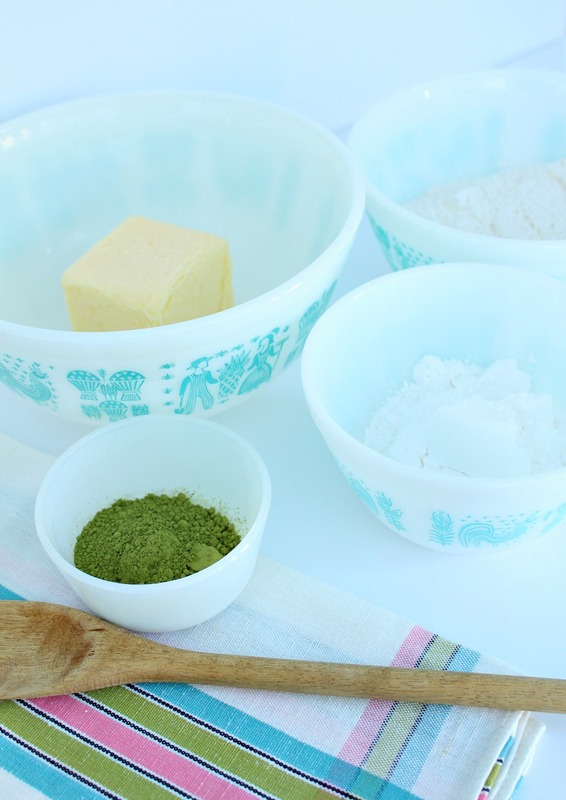 If you try baking with matcha, experiment with different quantities. 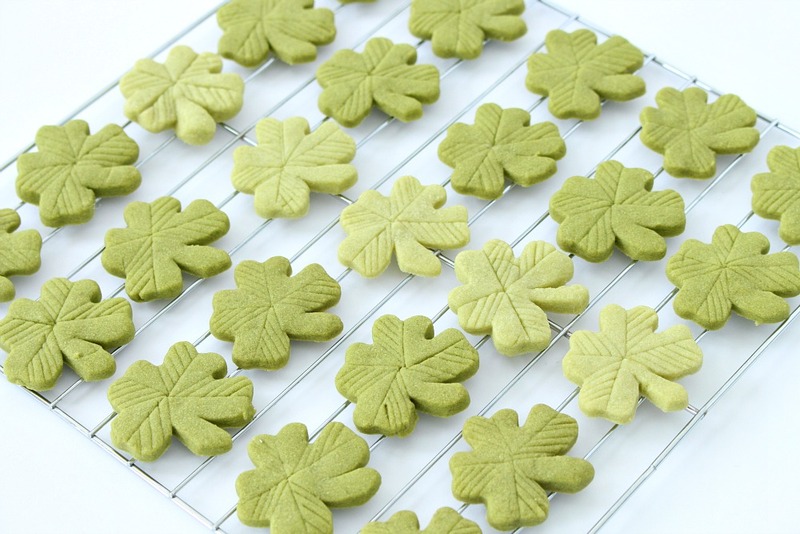 Too much matcha can produce a bitter cookie, so if you’re aiming for a darker green, try adding a little bit at a time and then pinching off a bit of dough to taste. 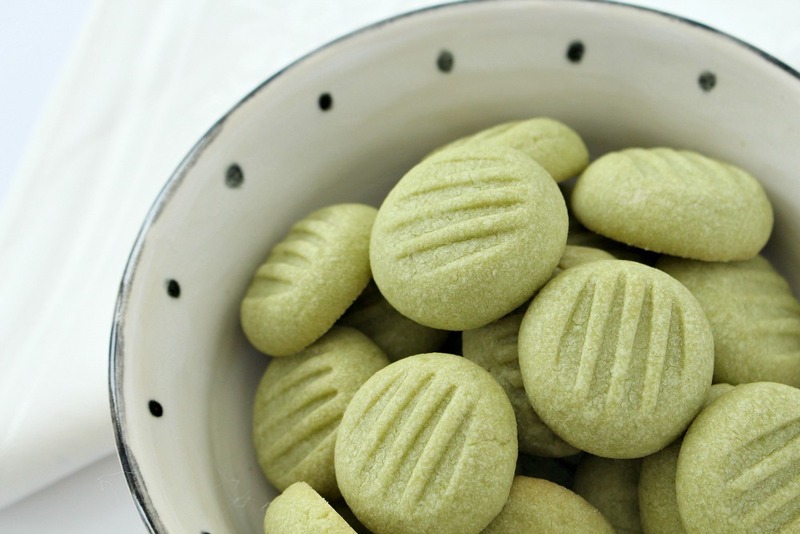 I love that these matcha tea shortbread cookies aren’t coloured with artificial food dye. 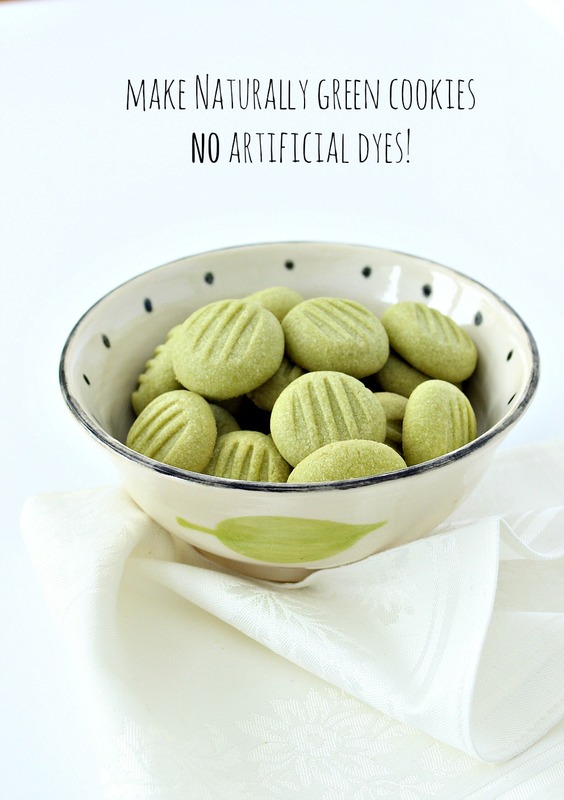 Behind the scenes I’ve been experimenting a bit with natural food dye alternatives. P.S. 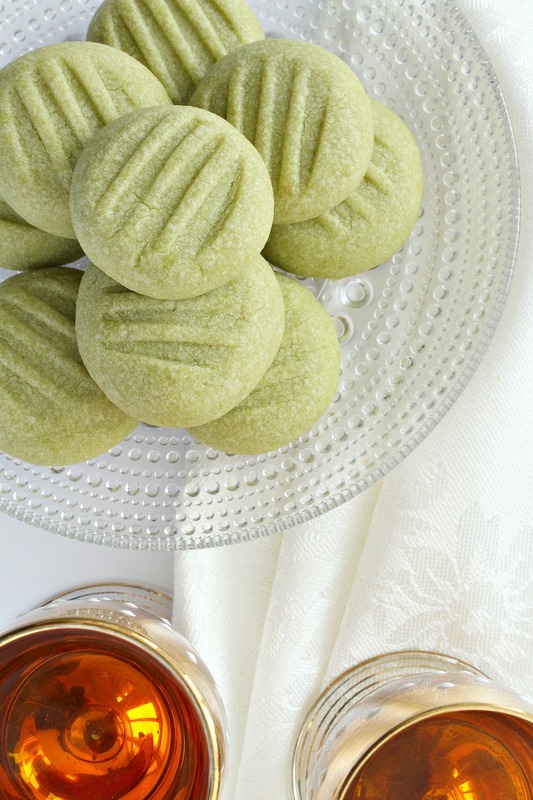 If you’re hungry for another matcha tea recipe, try my matcha madeleines! They look delicious and seem to be fairly easy to make, 2 of my conditions for baking. Is icing sugar what we call powdered sugar? Yes, confectioners sugar, icing sugar and powdered sugar are all the same thing, as I understand it. It's mot necessary, but it seems to make them smoother than granulated sugar. These are lovely. And yes, the fork flattened balls look like the peanut butter cookies my mom used to make. If you ever want to share Mummu's recipe, I'd love to try it. I've used my mom's old recipe but the dough is too soft and the cookies flatten out themselves- it may be because I sub butter for the shortening she used to use. Ah well.Thanks for the st. Paddy's inspiration- we don't go over the top and the kids are getting a little older but I like do a little something to acknowledge the day. These came out really nice! 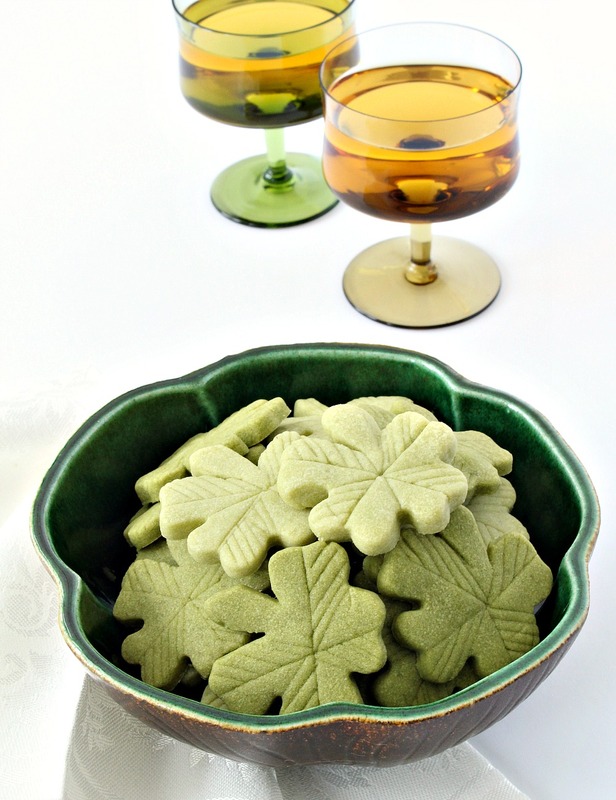 I added rose extract to it, the matcha and rose flavors went very well together! Everyone loved them.